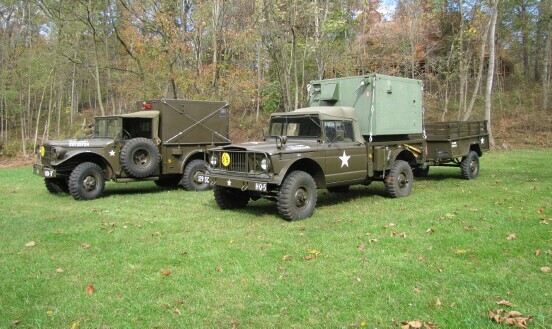 After WW2, the Army recognized the need for mobile hard copy tactical communication centers. During the war, radio voice messages were the norm with some stations using vehicle mounted voice only shelters. Copying and then typing messages was fraught with errors during the message writing and typing. Other methods employed were messengers traveling between units and wire line telephones. Once semi-permanent command centers were established, teletype and early facsimile via wire lines would be established. Of course, this was cumbersome and required miles of field wire which always needed repairs. The first self contained tactical mobile RTTY systems were produced just prior to the Korean War and the last type ended their service after the first Gulf War. Satellite and microwave communications with high speed data links ended the need for the less then ideal HF radio communications. On these pages you will find history, pictures and technical information for the commonly encountered sets. On the Manuals pages you will find TM’s, that we have scanned and found, for these sets. As we scan more documents and TM’s we will add them to the Manuals Pages. We have chosen to concentrate on the most common GRC units encountered. By this we know the AN/GRC-46 installed in a tracked vehicle became the AN/VRC-29 but, we will not have a page for the less common variations and rigs. There are several other less common sets and these are listed in the "Misc. RATT" page. We will post your pictures and any other information you may have. We certainly know we have not covered it all and there may be errors and omissions, especially where data was vague. Any information you can share relating to additional information on models and/or corrections to these pages is greatly appreciated. Check the News page for updates to the site. This site is dedicated to those who operated the “RATT RIGS” during their Army service and those of us, who find, restore and operate them today as a hobby. During my Army service I was fortunate to see and operate at least one model of each series, as shown on this site. Many thanks to those who provided information, pictures and other support!